This is the Original Key Safe! If it doesn’t say OKAY’S, it’s not the original. Since 1959 it has been without equal for the safety of your keys. Locksmiths, prison guards, security personnel, postal workers, casino workers, janitors and police officers carry their keys on OKAY’S Key Safes. They are very popular with professional businessmen as well. The OKAY’S Key Safe is secure, convenient, handy, dependable and made in the USA! The 39-NXB (black) is non-reflective and comes with a black key ring. A similar item is sold by "Lucky Line" and also called a "Key Safe"
Many sellers online have not updated their photos and are presenting the item as the "Okays Key Safe"
when in reality they are sending you the overseas made model. BUYER BEWARE. If it doesn't say 'OKAYS' on the face, then it is a cheap import. Okays Dual Keyper - NEW! The KEY KEEPER is hand made using top grain dyed leather and two nickel-plated OKAY’S KEY SAFES. It was designed to fit most duty belts. 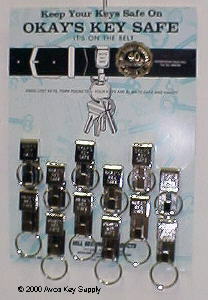 The KEY KEEPER has been popular with correctional workers at federal prisons. 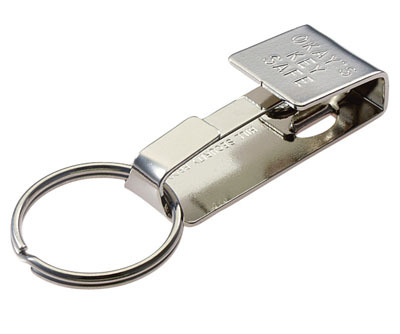 Workers say that they like the convenience of keeping their key chains and chits all together, ready to slide on or off their belt as one unit. The KEY KEEPER is also available with the black OKAY’S KEY SAFES. OKAY’S KEE PAL is designed to fit any belt up to 2 1/2 inches. Worn as shown, it is without equal in security. It has proven its dependability by its use in federal and state prisons throughout the United States.